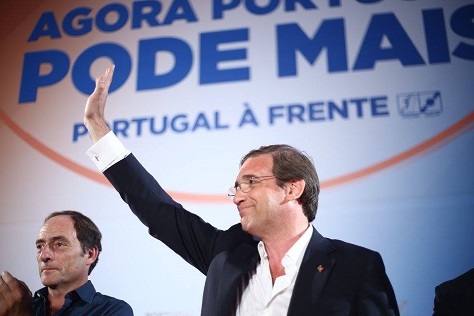 The headline from Sunday’s Portuguese parliamentary election results highlighted the fact that the country’s center-right government won despite the fact that it implemented an unpopular bailout program that entailed difficult spending cuts and tax increases. That’s true, of course, and the electoral coalition of prime minister Pedro Passos Coelho did emerge with the largest share of the vote. Later this week, it’s expected that he will receive a mandate to form a new government from Portugal’s president Aníbal Cavaco Silva. With neither of Portugal’s mainstream parties able to win a majority of seats in the country’s 230-member, unicameral Assembleia da República (Assembly of the Republic), early elections seem certain to follow in due course. 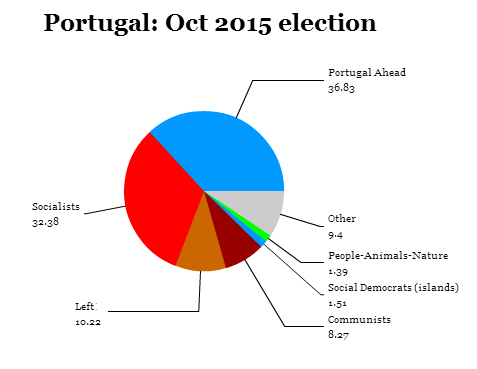 Though it’s likely that Passos Coelho’s center-right coalition, Portugal à Frente (Portugal Ahead) will indeed form a minority government, it will need the support of its chief opponent, the center-left Partido Socialista (PS, Socialist Party) to pass next year’s budget and other key measures. With the country no longer subject to the term of its prior bailout program, and with the economy set to grow for the second consecutive year in 2015, the Socialists will almost certainly demand a high price in exchange for support, including some relief from the austerity measures of the past half-decade. A disagreement, however, could lead the country to a snap vote, perhaps as soon as next summer. While no new elections can follow for six months, no minority government since the end of the Salazar-era military dictatorship in 1974 has been able to hold onto power for a full four-year term. In truth, no one won Portugal’s elections, and turnout dropped from 5.59 million (around 58%) in 2011, then a record low since the return of democracy, to just 5.38 million on Sunday (around 57%). The center-right’s ‘victory’ is as Pyrrhic as they come, the center-left’s modest gains belie doubts about past performance, and radical leftists haven’t received the same welcome as in crisis-struck Spain or Greece. Portugal might be the only place in crisis-plagued Europe where politics still feel like they’re stuck in the year 2000. There’s no virulent anti-austerity party like Podemos (the far-left movement of indignados in neighboring Spain) or the plucky SYRIZA of Greek prime minister Alexis Tspiras. There’s no citizen’s movement of the kind that powers Beppe Grillo’s Five-Star Movement in Italy or Czech finance minister and businessman Andrej Babiš’s ANO. There’s no anti-EU group like Nigel Farage’s UKIP or the eurosceptic Alternative for Germany. There’s not even an anti-immigrant force like the far-right parties of Scandinavia or Marine Le Pen’s Front national in France. It’s still a country that only last year returned to GDP growth after four years of recession in the past half-decade, a country with a 13% unemployment rate, a country that has hemorrhaged hundreds of thousands of educated graduates to jobs elsewhere in Europe and the Lusophone world. Portugal concluded its €78 billion bailout in May 2014 ahead of schedule (and without needing a second bailout) after a program of income tax and VAT increases and cuts to social spending, wages, benefits, unemployment benefits and public-sector jobs. Still, no one seems incredibly angry in Portugal about any of this. That’s perhaps one reason why the current center-right government, headed by prime minister Pedro Passos Coelho, has such a good chance of at winning reelection on October 4, when voters will elect the 230 members of Portugal’s unicameral Assembleia da República (Assembly of the Republic). Polls show that his center-right electoral coalition, anchored by the Partido Social Democrata (PSD, Social Democratic Party), will win the largest share of the vote. That’s probably only because Passos Coelho was smart enough to join forces with his junior governing partner, the more socially conservative Centro Democrático e Social – Partido Popular (CDS-PP, Democratic and Social Center — People’s Party). Together, the coalition now holds a narrow lead over the opposition center-left Partido Socialista (PS, Socialist Party), led by the charismatic former mayor of the Portuguese capital of Lisbon, António Costa, who has served as a minister in several administrations, most recently as interior minister in the cabinet of now-disgraced former prime minister José Sócrates. 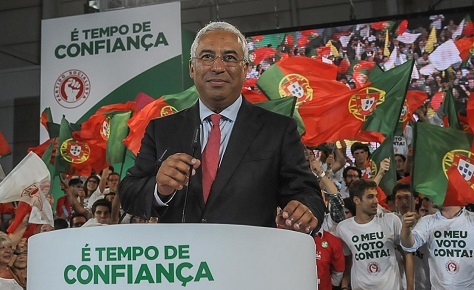 Although the forces of the united Portuguese right will likely fall far short of their 2011 electoral victory, the Socialists will likewise not achieve the same clear victory of the 2009 election. 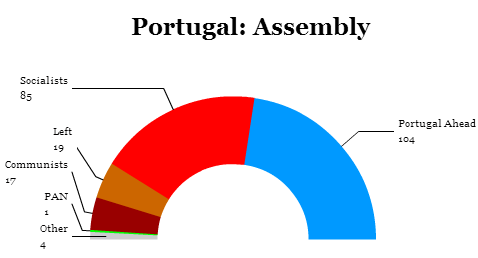 While that means the newly united Portuguese right is favored to win a narrow victory, it also means that no single party will have a majority in the National Assembly. Another explanation for the election’s conundrums? Twenty-two days later, Portugal is set to return to its center-right government, capping a month of twists and turns in a political crisis that began with the resignation of Portugal’s finance minister Vítor Gaspar and, then, the resignation of foreign minister Paulo Portas over the austerity program that Gaspar had been in charge of implementing as a condition of Portugal’s €78 billion bailout. 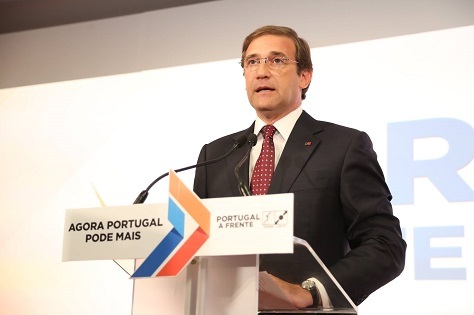 Portugal’s prime minister Pedro Passos Coelho (pictured above) reached a deal over a week ago to continue the center-right government led by prime minister and his Partido Social Democrata (PSD, Social Democratic Party) in coalition with the more socially conservative party Portas leads, the Centro Democrático e Social – Partido Popular (CDS-PP, Democratic and Social Center — People’s Party), soothing the mercurial Portas by appointing him deputy prime minister and giving him additional input over future bailout discussions and the course of Portuguese economic policy. 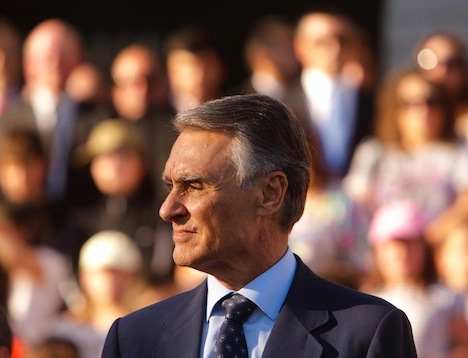 But Portugal’s president Aníbal Cavaco Silva, formerly a PSD prime minister from 1985 to 1995, and himself often the subject of Portas’s barbed criticism, refused to approve the deal, instead asking the two parties to bring the opposition center-left Partido Socialista (PS, Socialist Party) into government for a ‘grand coalition’ that would govern through June 2014, the end of the current bailout program. Obviously, the Socialists would never join a government when they lead polls by nearly 10 points, despite the fact that it was the decision by Socialist prime minister José Sócrates to seek a bailout that led to snap elections in June 2011 that brought Passos Coehlo and Gaspar to power. Until today, Portgual’s beleaguered government looked like it would avoid crisis — just barely. But the decision by Portugal’s president to seek a broad unity government to carry out the terms of Portugal’s bailout program has cast doubt again on whether the center-right government led by Pedro Passos Coelho will be able to serve through the end of its natural term of government in 2015 or at least long enough to see through the termination of the €78 billion bailout program in June 2014. Despite a deal last week that saw Passos Coelho’s more conservative coalition partners agree to return to government, Portuguese president Aníbal Cavaco Silva, who served as prime minister of Portugal from 1985 to 1995, is now pushing for a broader coalition in light of risks that the government might falter again. Cavaco Silva’s top priority is that Portugal has a reliably strong government to see through the bailout program next year and to avoid snap elections now in favor of early elections sometime next June. But that appears to have backfired, and it remains unclear just what will happen next in Portugal’s governing crisis — Cavaco Silva’s ploy may have made early elections even likelier, which are certain to become a referendum on further austerity measures in accordance with Portugal’s bailout. The political crisis comes at a time when Lisbon was set to host International Monetary Fund and European Union officials next Monday for a review of the bailout program and amid reports that Portugal will require a second bailout when the current one runs out next year. Portugal’s most recent crisis began when finance minister Vítor Gaspar resigned on July 1 after rising complaints over the implementation of the bailout program. Gaspar, a technocratic economist first appointed after the June 2011 elections that swept Passos Coelho and his center-right Partido Social Democrata (PSD, Social Democratic Party) into power. He had become the poster child for austerity and widely reviled as Passos Coelho’s party has fallen up to 10 points behind the main center-left opposition, the Partido Socialista (PS, Socialist Party) in polls. Passos Coelho immediately appointed treasury secretary Maria Luís de Albuquerque as Gaspar’s replacement, but the following day, his foreign minister Paulo Portas resigned. Portas, also the leader of his more socially conservative coalition partner, the Centro Democrático e Social – Partido Popular (CDS-PP, Democratic and Social Center — People’s Party), indicated that he would pull his party’s support from the coalition in opposition to the new finance minister’s appointment, arguing that it marked a continuity of policy with which Portas and his party now disagreed. Nonetheless, a weekend deal between Passos Coelho and Portas appeared to have healed the rift — Portas would become deputy prime minister and take a larger role in steering the country’s finances, though de Albuquerque would remain as the new finance minister. Though the deal required Cavaco Silva’s approval, it seemed likely to win it this week, given that Cavaco Silva (pictured above) had been crucial in bringing Passos Coelho and Portas back together. Instead, Cavaco Silva’s call for a unity government to include the Socialist Party as well has renewed the Portuguese political crisis, given that the Socialists and their new leader, António José Seguro, continue to push for early elections rather than join a unity government. 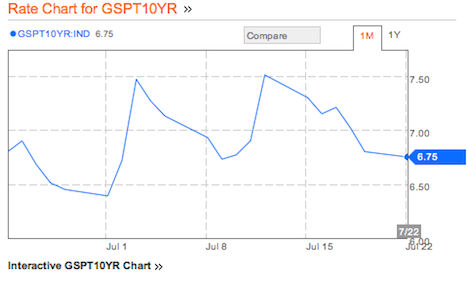 Though Portuguese 10-year bond yields have fallen from a recent July 3 high of 7.47%, they edged up to a still-worrying 6.77% today after Cavaco Silva’s gambit. While Cavaco Silva may have failed, his logic isn’t unreasonable. Cavaco Silva’s goal was to steer Portugal between what he viewed as two poor alternatives — one in which he’ll have to trust Portas and the conservative Christian Democrats to see through the bailout program, and another in which Portugal faces snap elections that could result in a hung parliament (or worse, if the two major leftist blocs outperform already robust expectations). 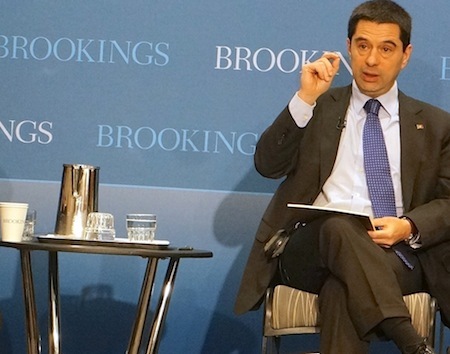 Portuguese finance minister Vítor Gaspar (pictured above) spoke to a small audience at the Brookings Institution Tuesday, notably less than 36 hours after Cyprus and the ‘troika’ of the European Commission, the European Central Bank and the International Monetary Fund agreed on the terms for a Cypriot bailout — the fifth such eurozone bailout during the currency zone’s sovereign debt crisis. Of course, Portugal is one of those of other five countries, and Gaspar, for the past 21 months, has been responsible for implementing the terms of Portugal’s own bailout program. 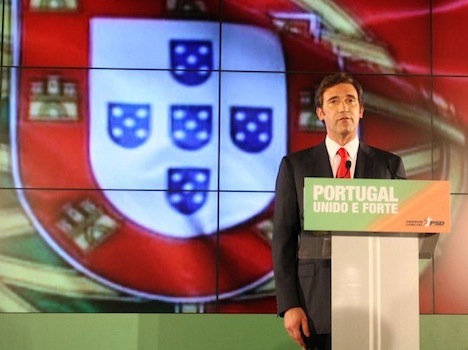 Gaspar presented as optimistic a case as possible for Portugal’s current economic state on Tuesday. But he admitted that despite gains in lowering the country’s budget deficit, restoring Portuguese banks to greater health, and boosting the growth of Portuguese exports (the latter as much a sign of painful ‘internal devaluation’ of wages and incomes within Portugal as any sign of newfound productivity or competitiveness), Portugal’s GDP growth and employment rate remain problematic. The Portuguese economy contracted by 1.6% in 2011 and 3.2% in 2012, and is expected to contract by a further 2.3% in 2013, while its unemployment rate, as of the last quarter of 2012, is 16.9%, its highest level yet. As Gaspar noted, Portugal’s economy — second only to Italy’s — was already on the ropes when it entered the eurozone. In particular, from 1990 to 2012, he claimed that the Portuguese economy marked a poorer performance than either Japan during its ‘lost decade’ or the United States during the Great Depression. Regardless of whether that’s exactly right, there’s no denying that Portugal has faced long-term structural problems — since 2000, it’s notched GDP growth in excess of 2% just once (in 2007, when it grew by 2.37%, and that was at the height of the eurozone and global credit boom). Gaspar placed much of the blame on Portugal’s failure to pursue macroeconomic stability in accordance with ‘best practices’ — i.e., Portugal simply failed to adjust properly upon accession to the eurozone 14 years ago. Gaspar serves under prime minister Pedro Passos Coelho, whose liberal, center-right Partido Social Democrata (PSD, Social Democratic Party) came to power in the last election in coalition with the more socially conservative Centro Democrático e Social – Partido Popular (CDS-PP, Democratic and Social Center — People’s Party). Among his solutions are greater EU-level banking union as a means of reducing the risk premium associated with peripheral economies such as Portugal’s — Gaspar added that the higher borrowing costs that constitute financial headwinds, especially in the context of budgetary adjustment. But it was surprising not to hear any mention of the emigration of up to 1 million Portuguese from the country over the past 14 years — and nearly 250,000 since 2011 alone. Passos Coelho in late 2011 was criticized when he suggested that young, enterprising Portuguese citizens should emigrate to Portuguese-speaking countries, such as Brazil in South America, or to Angola in southeastern Africa, still in the throes of an oil boom. Angolan visas issued to Portuguese nationals jumped from just 156 in the year 2006 to nearly 150,000 by mid-2012. Mozambique, another former Portuguese colony, apparently issues 200 visas a day to Portuguese nationals. Invariably, that escape valve has kept Portuguese unemployment lower than the rates over 25% recorded in Spain and Greece.